Defender Liam Donnelly’s Hartlepool United fate will be revealed this week. 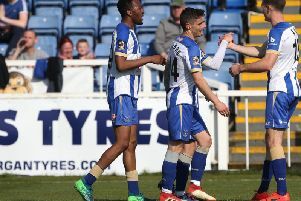 Whether he stays at Victoria Park or departs, with Pools’ retained list set to be announced, the out-of-contract Northern Irishman believes Matthew Bates’ men should be pushing for promotion back to the Football League next season. “We should be challenging any team in this league,” said the 22-year-old. “We should be up there challenging for promotion. Donnelly is widely expected to end his two-year tenure at the Vic this month. He is not thought to be the only one, with 11-goal top-scorer Michael Woods and Devante Rodney also coming to the end of their contracts. Former Fulham defender Donnelly has been watched by a whole host of Scottish Premiership clubs and a number in the bottom two tiers of the English Football League. Despite injuries and international call-ups stalling his campaign somewhat, scouts cannot fail to have been impressed by the Northern Irish under-21 skipper in National League action, either on the right or in the centre of Pools’ defence. One trait that has come to the fore of late is his ability from the spot - netting for club, on the final day against Tranmere, and country from 12 yards. “I took a few when I was younger,” he said. “I didn’t really get much chance to take one recently, until the under-21s last summer when we got a last minute penalty and stepped up to take responsibility. I got some confidence from that. “And now I practice them regularly in training. “Batesy (Matthew Bates) stuck my name down for one and I am delighted he did.